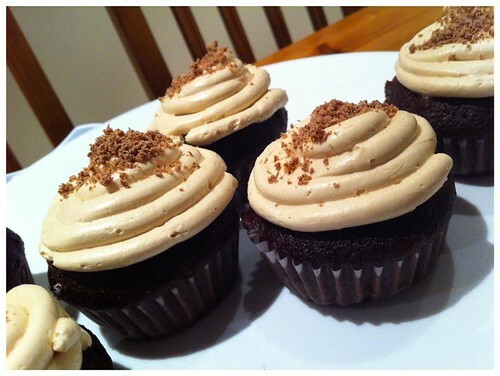 Yesterday, as I perused Miss604’s blog as I (somewhat religiously) do, I came across a post for the Vancouver Cupcake Throwdown 2012. Naturally, as a home-based baker, I was intrigued and read on. As it turns out, this annual charity event features 20 local cupcake bakers duking it out for the title of best cupcake. After a bit of consideration, I decided to sign up in order to do something that I love while supporting a worthwhile local charity. When: Thursday, February 16, 2012 from 7:00 p.m. – 10:00 p.m. This fun, family-friendly event features music from live DJs, beverages and excellent raffle prizes – including a much-coveted KitchenAid stand mixer! Please consider coming out to support H.A.V.E., sample some tasty cupcakes and have fun! I’ll be there, toting the cupcakes seen above that I recently created for a birthday party. The only problem? They don’t have a name! These fudgy Dutch chocolate cupcakes are stuffed with mocha whipped cream and topped with handmade caramel buttercream frosting and a sprinkling of shaved Lindt milk chocolate. If you have an idea of a name for these cupcakes, leave it in the comments below. I look forward to seeing you on February 16th! To learn more about my home-based baking, visit me on Facebook!